Our Lord’s Day started in Cebu City with services at the Cebu City congregation. Jonathan Carino has labored with the church since it began in 1993. Since I have been coming to visit with them since 2002, I have come to know and love many of them. I preached for the morning worship on “She Has Done What She Could” from Mark 14. We had to leave immediately after the worship and before the classes in order to make our flight back to Manila so we can travel to Masbate tomorrow, the Lord willing. Our travel plans to Masbate have been abruptly changed. The flight from Manila to Masbate was canceled causing Jonathan to make a rushed change of plans at the last minute so that we could arrive on Monday morning when our pre-paid time at the venue begins. As it presently stands, we will first fly to Legazpi early tomorrow and try to catch the first fast-craft from there to Masbate. If it works, we should be there just a little after the lectures are scheduled to begin at 9am. We also received word from Roy Matta that one of the men present for the lectures at his place on Friday returned this morning and asked to be baptized into Christ. We are thankful to God for the power of His word to convict and persuade honest hearts! God bless! Our Saturday began as a group of seven brethren from Cebu City (mostly preachers) met me at the hotel with a van and driver hired to take us to Bogo City at the northern end of Cebu Island. The city was devastated by Typhoon Yolanda one year ago today, but shows signs of much recovery at this point. I have been told it is in much better condition than Tacloban or other cities on Leyte, but I have not seen those places since January. The Lord willing, we will be working on Leyte at the end of next week. The church in Bogo City started with the baptism of just a handful of souls earlier last year after some lectures were held there. 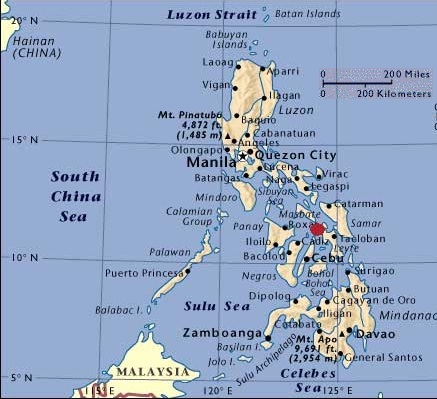 (The work on Masbate Island began as a result of two brothers who heard the gospel at that time as well.) A year ago when we came bringing benevolent help provided by Christians in the U.S., there were 13 members of the church meeting in the center of Bogo City. Before the lectures today, brother Rupert informed us that there are now 93 baptized believers that make up the church in Bogo City! It is obvious that they have been working and are seeking to grow in their understanding of the word. When we arrived at the venue this morning, a crowd that packed and overflowed the room was already assembled. They were all Christians, mostly members of the congregation in Bogo City, with one or two brethren from nearby areas. I preached a two-part lesson on The Blood of Christ and the Salvation of the Sinner. With a short break between for me to rest my legs while Roy Matta led us in some songs. Jonathan Carino then started a lesson on “Why Are People Lost?” He broke it in the middle so that we could take our lunch. After lunch, Jonathan finished his lesson and then I presented a short one on “Striving for Faith” from Philippians 1:27-30. We ended the lectures at about 3:30pm so we could try to make it back to Cebu City before it became dark and so all could prepare for tomorrow’s worship. However, we ended up getting back to my hotel well after dark due to the very heavy traffic. After posting this report, I will go for supper and get back to prepare for the lessons tomorrow and repack bags to fit our limitations for travel to Masbate and on to Leyte. The flights to both place are on very small planes with strict limitations on baggage allowance. God bless! Please excuse the absence of reports for the past few days. I have been fighting a bug that I was battling at home before leaving and it has zapped my energy level. Hopefully, I am over the worst as I have started an antibiotic that I always carry for such situations. Monday and Tuesday were travel days, as I left OKC at 6:00am and arrived Tuesday night in Manila. The flights were fairly rough most of the way making rest more difficult. Due to winds, our flight path was much farther west than normal which left us in Russian airspace for a long period of time. Given their recent actions, that was not the most comforting route to take. Wednesday was spent entirely in my hotel room battling the bug and watching election results. Fortunately, the hotel had Fox News channel, so I was able to follow the returns coming in on your Tuesday night while it was Wednesday morning for me. Those who know me know the results had a very positive effect on my spirits! Thursday, I preached in lectures at the building of the congregation in Pasay where Rody Gumpad labors. It is on the fourth floor of a building with no elevator. The studies were designed for preachers in the Manila area. I spoke about “The Sermon on the Mount” for about 3 hours total in the morning. The lessons were designed to show that Jesus was announcing the principles of His new kingdom and law in that sermon, not merely explaining Old Testament law. In the afternoon, I presented a shorter lesson on “Why We Do Not Burn Incense in Worship Today.” Of course, the lesson was really aimed at showing the problem with instrumental music in worship today with the burning of incense being used only to present parallel arguments that all could readily see as false. We ended the session with an extensive Question/Answer period. Immediately after the lectures, I left for the airport and flew to Cebu, arriving late. After a very late supper, I hit the bed exhausted. Friday (today) was spent in Mandaue, a part of the greater Cebu City area. Brother Roy Matta preaches there and it is always good to be with him and his family. During the morning, I presented two sermons on “Salvation and the Blood of Christ,” an extensive examination of how, when and why we are saved by the blood of Christ. In the afternoon, I preached on “Foundations of Faith” with Hebrews 11:1-3 serving as the starting point for the study. The day ended with a lesson on “She Has Done What She Could” from Mark 14 showing why the actions of this woman were exemplary. There were a few non-Christians present for the studies, but none responded at the invitation. After reporting on the last day of lectures in northern Luzon, I had a day of travel on Friday, flying from Tuguegarao to Manila. With a good night’s sleep, it was another day of travel from Manila to Angeles City. However, Saturday’s travel was by bus — always an interesting journey here in the Philippines. The traffic in Manila was unusually heavy, especially for a Saturday. So, the trip took about an hour and a half more than normal. Upon arriving Angeles City, Lordy Salunga picked me up. We went for a quick supper and he took me to the hotel where I prepared for preaching the next day. On the Lord’s day, I preached a two-part sermon on “The Blood of Christ and the Salvation of the Sinner” which I preached at home a few weeks ago. Here, I did the first part during the Bible class and the second during the assembly. There was a denominational lady present that they have been teaching. There were no visible responses. Immediately after the services, Lordy took me back to catch a bus as their schedule was very busy. The trip took far less time to get back to Manila — the shortest trip between Angeles and Manila I have ever had. Today (Monday), I was taken by Ely Ebeunga to the maximum security prison in Muntinlupa to meet Kathy and get a document needed for Willie’s release, then go to another government office in Manila for another document needed. After some delay, it appears the needed documents have now been satisfied. Please keep this matter in your prayers that he may soon be released. Tomorrow morning, I fly out on my way back home, the Lord willing. If I counted correctly in reviewing my reports, there have been 12 souls baptized into Christ during this two-week effort. I have talked with Jonathan Carino today with preliminary plans for another trip to the Visayas starting in early November. With my illness over the past several months, I am far behind in meeting invitations to preach. This trip answered commitments that were 2 years old. The Lord willing, the next trip will answer requests from denominational preachers and denominational churches that have asked us to come for several months to over a year. The field is indeed white to harvest! I am thankful to God for His blessings to allow me to take part in the work again. I am also thankful to each of you for helping to support and encourage this work. Without you, it would not be possible and I cannot adequately express my thanks for your help. God bless! Our last day of preaching in northern Luzon was with the Aquib church in Piat, Cagayan. (The path to the building requires a bit of a climb.) Brother Dennis Yuson preaches with the congregation. Dennis is a very faithful man who has served the Lord with great zeal and sacrifice all of the time that I have known him. He has recently lost all of his support because it was all coming from a congregation that has helped for many years, but is unable to continue. He is now in great need, but continues an exemplary work. After a period of singing, I gave the first lesson on “Salvation and the Seed - God’s Word.” It was a fundamental lesson showing that the gospel of Christ is where we must go for all authority in religious practice today. Since Piat is one of the biggest strongholds for Catholicism in the Philippines, I thought that was the best place to start our studies for the day. Jerome Forelo summarized the lesson into Tagalog, which is the national language. Rody followed with a lesson on “Heed God’s Warnings.” At the end of the lesson, he extended an invitation and two young ladies responded to confess their faith and be baptized into Christ. Following the lunch break, I preached on “If I Obey the Gospel, I Will…” It was a very fundamental, first principles lesson on the plan of salvation. Edgar Licodini summarized the lesson into the Ilocono dialect which is spoken by many in this area. Rody ended the studies for the day with a lesson from James 4 on “This Is Your Life.” After that lesson, he again extended the invitation, but there were no more visible responses. It was so extremely hot today and we felt totally washed out by about 4pm when the meeting ended. Both Rody and I are also having a great deal of problems with our voices and a bothersome cough. I will be happy to sleep in a little tomorrow as my flight to Manila does not depart until about 1pm. Rody and Tessie say they will also enjoy the rest. How Rody does this week after week in an almost continuous motion of preaching in so many places is beyond me. He and Tessie have my admiration for all they do in the kingdom! We ended the day with a final meal at the Gumpad’s home. To their children and grandchildren, I am “Papa Bear” and I enjoy the time with them so very much. One of Mark and Joy’s children is a girl named for my Leslie! It was a good way to end our work together. Our venue for Wednesday was the building of the Lapogan congregation in Gattaran, Cagayan. Brother Joben Jocobo, who was a former student in a Preacher Training Program at Tuguegarao, is preaching there along with his good father, Celso. Celso has been a steady influence for good for a number of years along with his faithful wife, Florencia. Joben has been one of the shining star to go through the PTP and has done much good in the cause of Christ together with his good wife, Miriam. The morning session started with my sermon on “Repentance” which focused on the nature of true repentance as seen in 2 Corinthians 7:10-11. Rody summarized the lesson briefly, then preached a lesson on “Repeating Naaman’s Mistakes” from 2 Kings 5:1-14. It noted the things which did not bring cleansing to Naaman and paralleled those things with mistakes man can make in religious matters which will not result in the cleansing of their souls. At the end of the lesson, Rody extended the invitation and four responded to be baptized. After lunch, I presented an extended lesson that examined “Baptism in the New Testament vs Denominational Baptism.” We started with the principles on baptism introduced in the baptism of John, then looked at the baptism of the Great Commission as it was carried out in the book of Acts, and ended by seeing how baptism was viewed in the epistles as Christians looked back on their baptism. Rody summarized the lesson in the dialect and extended another invitation, but none responded at that time. We are about to have the Wednesday evening Bible study at Tuguegarao and I have been asked to teach on Psalm 127. So, I will close for now and get ready. Again, I am very thankful for your interest in this work and for your prayers. God bless! Today’s venue was the building of the Metro Tuguegarao congregation where we had an all-day Bible study. The announced purpose was for preachers and their wives in the area to come for studies directed at helping and encouraging them. However, as is often the case, others came besides just preachers and their spouses. Several non-Christians came as well, so I changed the plan for the lessons to adjust to that need in the afternoon. The morning began with a lengthy period of singing before the studies began. Rody led the congregation in a very spirited way and all were encouraged by the gathering of numerous brothers and sisters who lifted their voices together in praise to God. I the preached a lesson on “The Life of Joseph: Characteristics of Faithfulness.” It was especially aimed at discussing the needs of preachers and their families to give priority to faithfully delivering the word of God, living lives of purity, forgiving others, forsaking vengeance, depending on God’s providence and looking to our hope of a heavenly reward. After the lesson, Rody summarized in the dialect because several present did not know English. I the preached on “How Does Love Act? - Essentials of Bible Love.” This lesson was taken from Romans 12:9-13. Rody also summarized it in the dialect before we dismissed for lunch. Since the morning session had gone to 1pm, we had only time for one lesson and summary in the afternoon. So, after some more congregational singing, I preached on “The Blood of Christ and the Salvation of Sinners.” The lesson examine how blood was required for remission of sins, but the blood of animals under the old law could not take away sins. But the blood of Jesus Christ provided a price of sufficient value to forgive the sins of all men. The conclusion showed how we come in contact with the blood of Christ and are forgiven of our sins when we are baptized into the death of Christ. Rody summarized the lesson again and extended the invitation. Two precious souls responded and were baptized into Christ, rising to walk in a new life free from sin! Thank you again for your continued interest in this work and your prayers on our behalf. God bless! Our Monday began with a drive of about one hour to work with the Centro Rizal church which is in the province of Kalinga. Brother Geronimo Ganela preaches regularly with this congregation. While we had to pass the same rough highway as yesterday, the building is very near the highway, so we avoided the pothole tour experienced yesterday. For this, I am very grateful! The day’s meeting began with the singing of numerous songs, many in the dialect, and then the preaching. Rody began with a lesson on “Problems Facing the Church.” I followed with a lesson on the Sermon on the Mount (Matt. 5-7) showing it is the foundation of the gospel message, not a correction of misunderstandings about the old law. We noted in some detail how the gospel differs in purpose, nature and substance from the law of Moses. We ended by making application to how a misunderstanding of the Sermon on the Mount has led many in denominations to believe we are still under that law and justify their religious practices on the basis of that law. We noted the same problem with those among brethren who have abused this passage in an effort to teach their “One Eternal Covenant” theories as well as false teaching on divorce and remarriage. After lunch, we had numerous songs and one sermon. I preached on “Grace, Faith and Works: Is Obedience Essential to Salvation?” It was a first principles lesson showing how grace, faith and works obedience come together in God’s plan for our salvation. After the lesson, brother Geronimo Ganela extended the invitation and Ben Vistro led a song of invitation. One man responded to the Lord’s call, confessed his faith and was baptized into Christ. Thank you again for your prayers and support. God bless! Our Lord’s Day labors began at the Metro congregation in Tuguegarao. Rody taught the Bible class. Since it was mostly in their dialect, I was not able to understand enough to give a synopsis. Our worship period followed a very short break. The singing for today was in English as were several of the prayers. I preached on “Striving Together for the Faith” from Philippians 1:27-30. There seemed to be very good attention and interest, but there were no visible responses to the gospel invitation. They had delayed their worship until 2pm for us to join them. By that time, it was sweltering with not even a stirring of a breeze. Rody did the Bible class in their dialect. At the end of it, he was so drenched with sweat he went to change his shirt in the car. Their worship was all in the dialect except for my sermon. I spoke on “Lessons Learned Too Late” and they seemed to fully understand it despite me preaching in English. At the invitation, there were no responses. After visiting and having snacks with Rolando, his wife and some of the family in their home, we returned to Tuguegarao. After another great meal at the Gumpad’s home, I returned to my hotel to get ready for tomorrow. The Lord willing, we will again be in Rizal, Kalinga, but working with another congregation where brother Geronimo Genela preaches. Please excuse the absence of reports for the past few days. I could not send them due to a lack of internet connection over the past few days. My last time to be able to connect was when I was in Manila on Wednesday. I am again in Tuguegarao where we have a connection and I hope we have resolved the problem which prevented logging in to the wifi here. Thursday was a day of travel, but not an ordinary one. Rody, Tessie and I were to depart Manila at 11:15am for our one-hour flight to Tuguegarao. About noon, we were informed our plane was diverted to Zamboanga, but assured another was coming soon for our flight. Two hours later, we were told that plane was had mechanical problems. At about 2:15pm, we were loaded on buses to take us to the plane at an auxiliary gate. (In other words, it was sitting out on the tarmac). After waiting in buses on the tarmac for over half an hour, we got on an unbelievably hot plane. After much sweat, we began to taxi towards our take-off runway, but soon stopped. After some time, we were informed the computers were “malfunctioning” so we would have to board another plane. 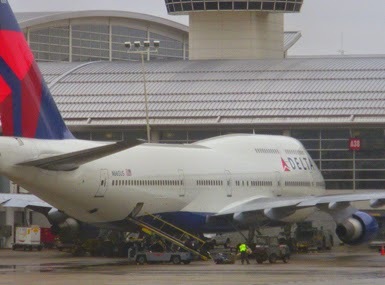 So, we went back to the spot on the tarmac, waited in a hot plane for a while, got on buses again, took a long ride to another hot plane parked at another spot on the tarmac, and boarded a third plane. After more than 5 hours of delay, we were finally able to leave. You may wonder what compensation you get after such a delay. The answer: one cup of Ramon noodles, but you have to provide the hot water! Ah, the joys of luxury travel! 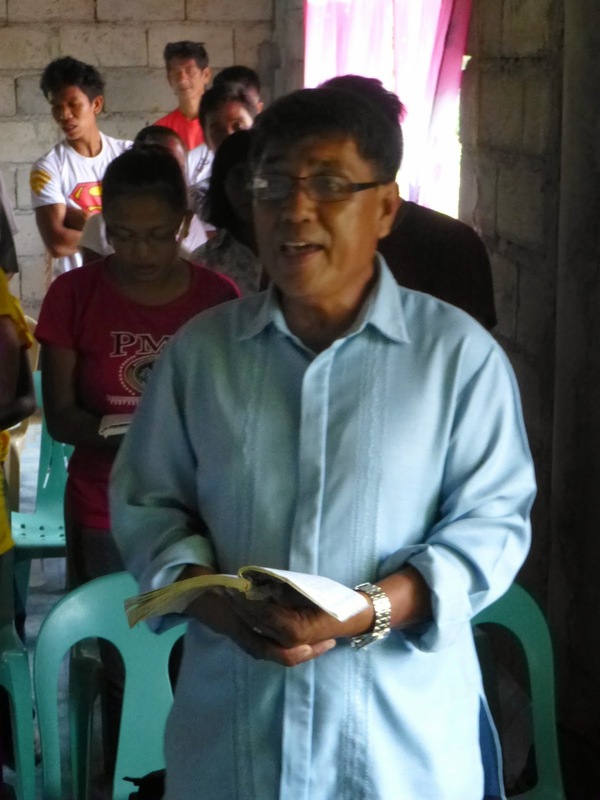 Friday, we traveled over three hours south to Quirino where Sammie Greneta preaches with the Saguday congregation. The effects of a recent typhoon Were evident in several places as some crops were destroyed and we experienced intermittent rain and wind from another typhoon coming towards northern Luzon at that time. It rained on and off at the venue throughout the day, but the attendance and interest were very good. I started the day by preaching on “Salvation and Saul.” Rody followed with a lesson answering several aspects of the premillennial doctrine. (The brethren there had asked Rody to speak on that subject since several Pentecostals had been invited and they were very trouble about that doctrine.) After lunch, I spoke on “Let Us Not Grow Weary” from Galatians 6:7-9. It was a lesson I had been asked to preach to encourage brethren not to lose heart in their service to God and to show all the greatness of the hope we have in a heavenly home which should give us a reason to continue a life of faith no matter the cost. Rody concluded the day with a sermon on the Lord’s church and how it differs from denominationalism. He ended by extending the invitation and two responded immediately to be baptized into Christ with another deciding to be baptized after a short question/answer period. After the dismissal, we spent a long time talking with Kathy Pastor, Willie’s wife, concerning what we learned on Wednesday and discussing plans for her to follow-up on his papers to assure the best possible chance for his release from prison in the very near future. Several individual brethren provided funds for me to use at my discretion and I used them to help Kathy have the funds needed to travel to and within Manila so as to do the vital follow-up for Willie’s release. The Lord willing, I will join her and others on Monday, September 30 to show interest in his case again at the Board of Pardons and Paroles. After spending the night at a small hotel in a city between on venue on Friday and the one for Saturday, we traveled about two hours to the place for preaching today. It was in Roxas, Isabela where Danny Dangalan preaches. Our venue was on the fourth floor of a hotel in spacious function room. Of course, there was no elevator, so it was up the very steep, small stair we go. Since the effects of the typhoon were getting a little worse as we were further north than the previous day, the wind was a little stronger, but the rain was diminished. It made for less heat in the room which had no air conditioning. To start, I preached on “God’s Use of Prophets,” a lesson on inspiration. Rody followed with a lesson that combined two or three of his lessons, closing with an invitation. None obeyed the gospel at that time. Since it was only a half-day lecture, we start back to Tuguegarao after eating some lunch and arrived safely about two hours later. Tomorrow, we will be preaching with the Metro Tuguegarao congregation in the morning and traveling to Palca in the afternoon, the Lord willing. Thank you again for your interest in the work of the Lord here in the Philippines. 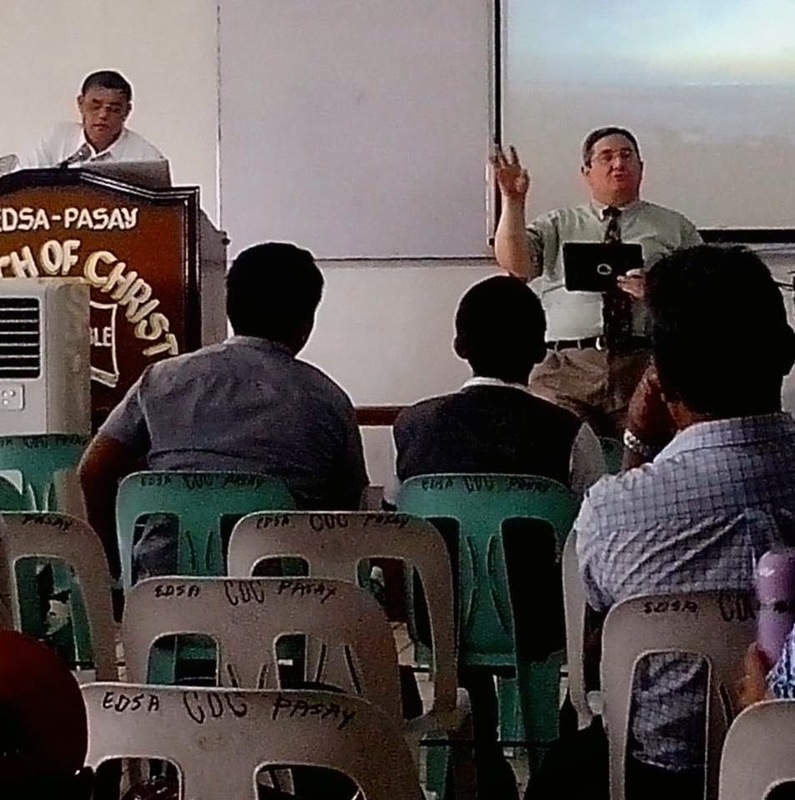 This blog is intended to inform those interested in the work of preaching the gospel that is ongoing in the Philippines. During trips, it gives a daily update of work done. At other times, it has announcements or information about the Philippine work. Please feel free to send the link to others or copy the reports for others to read (as long as no change is made to the content). God bless!